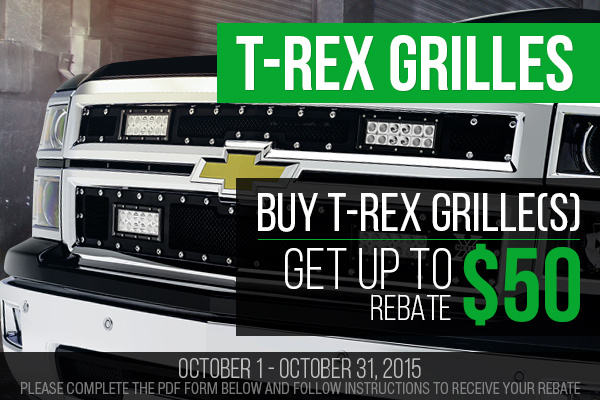 Buy T-Rex grille - Get a rebate! - Ford F150 Forums - Ford F-Series Truck Community. From October 1 through October 31, 2015, don't miss your chance to buy the finest automotive grilles in the world and save up your money! With the new promotion rolled by T-REX Grilles at CARiD everything is possible! Purchase any X-Metal Grille and receive a $25 rebate, buy any Torch Grille and receive a $50 rebate. Make sure to complete the PDF form below and follow instructions to receive your rebate. Quick Reply: Buy T-Rex grille - Get a rebate!